Cannabis has been off-limits to doctors and researchers in the US for the past 80 years, but recently scientists have discovered its anti-cancer properties. Armed with only these laboratory studies, desperate parents obtain cannabis oil from underground sources to save their children from childhood cancers. 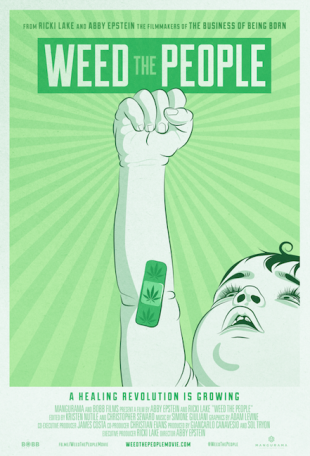 Weed the People follows these families through uncharted waters as they take their childrenâ€™s survival into their own hands. Some of their miraculous outcomes beget the unsettling question at the heart of the film: If weed is truly saving lives, why doesnâ€™t the government want people to access it? I had a chance to speak exclusively to director Abby Epstein, who I knew about from The Business of Being Born. I wanted to know how she heard about topic and what made her want to make this film. Abby Epstein: â€œThis is kind of an unusual story. [Laughs.] It wasn’t really on my radar at all. Ricki Lake and I, we start films in very organic ways and usually around things that come from our personal lives. So, this actually happened about six years ago, when Ricki was on Dancing With the Stars. There was a whole story where there was a very sick little girl going through chemo. She loved Ricki and she loved DWTS and used to watch her every week and root for her. The girl’s mother was posting videos of her on Twitter and it was very cute. We started this relationship and then Ricki flew her out to see the show and ultimately, Ricki and her late husband Christian, decided to try to help find some more alternative solutions for this little girl because she had tumors growing all over her body and the chemo was killing her. She was like 35 pounds. At 11 years old, Angelaâ€™s son Chico was diagnosed with a rare soft tissue cancer called rhabdomyosarcoma.Â Chico endured months of brutal radiation treatments and chemotherapy, which he barely survived. During that time, he also became addicted to opiates because of all the pain medication given to him in the hospital. Angela began using cannabis to treat Chicoâ€™s severe nausea and then found research showing that cannabis actually had anti-tumor properties as well. Sophie Ryan was diagnosed with an optic pathway glioma brain tumor at 9 months old. Her only treatment option was chemotherapy â€“ which would stabilize the tumor, at best.Â Sophieâ€™s prognosis was that she would lose 100% of her vision and face other life-threatening issues.Â The Ryans learned about cannabis oil through other parents on Facebook and became interested in trying it after reading the scientific research. Mara Gordon was a process engineer by training who became incapacitated by pain after a botched spinal surgery.Â Desperate for options, Mara began treating herself with cannabis infused edibles, based on her Aunt Zeldaâ€™s carrot cake recipe. At 2 years old, Jaclyn and Jimâ€™s daughter Cecilia was diagnosed with a Wilmâ€™s Tumor. Told that her cancer was 99% curable, Cecilia went through 9 months of chemotherapy only to suffer a devastating relapse as the cancer spread to her lungs and became Stage 4. The von Harzâ€™s decided to try cannabis oil as a last resort after opting out of more chemotherapy, which Cecilia did not seem likely to survive. AJ Kephart was diagnosed at 13 years old with stage 4 osteosarcoma (bone cancer.) After multiple surgeries and chemotherapy AJ continued to relapse. Out of treatment options, AJâ€™s oncologist told the Kepharts that they should look to â€œalternative medicineâ€ because he only had weeks to live. 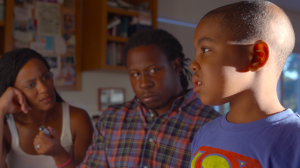 The Peterson family live in Chicago, but after son AJ (6) was diagnosed with a terminal brain tumor, they came to Los Angeles seeking cannabis oil.Â With no other medical options for AJ, the Petersons wanted to try everything they could to extend his life. They set up a residency in LA to be able to consult with Dr. Bonni Goldstein and get cannabis oil for AJ from Mara Gordon of Aunt Zeldaâ€™s Oil. 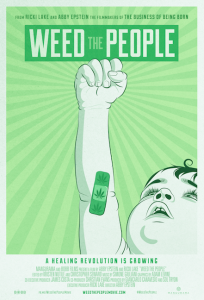 Weed the People opens in theaters Friday, October 26th.